The White Elephant is a great place to stay, rain or shine. Most travelers possess a healthy dose of optimism, usually envisioning sunny skies at their destination. So, understandably it can be disappointing to arrive at a waterfront resort on a cold, rainy day. Our long-awaited first visit to Nantucket Island was scheduled for June, when the weather is usually welcoming. We had left two days of severe thunderstorms and flooding behind us in New York City (that delayed our air departure for several hours) and were hopeful the skies would clear once we arrived in Massachusetts. That didn’t happen. To be honest though, we quickly got over the cloudy-with-intermittent-rain-day disappointment when our reservation was upgraded to a waterfront suite. Perhaps, that’s the upside to persevering when fair weather travelers might otherwise cancel. Our corner suite (252)—one of 66 guestrooms, suites and cottages at the boutique White Elephant hotel on Nantucket Harbor—couldn’t have been more welcoming and homelike. We turned on the gas fireplace in the sitting area to take the chill out of the room, and from our window overlooking the bay, watched the ferries and smaller boats maneuvering in and out of the busy waterway. The books and local magazines placed on cocktail and end tables seemed to have been carefully selected to acquaint guests with the culture and life on the Island. But in any hotel room, the bed is the centerpiece and this was a great one with white, fluffy linens, and plenty of pillows contrasted against the oversized brown leather headboard. An embroidered throw pillow had a white elephant, a whimsical theme that recurred in artwork (and in the hotel gift shop). The suite also had an upholstered sofa bed with comfortable accent chairs in a coordinating fabric. There were two flat-screen TVs, an iPod dock, electronic heat and air-conditioning controls. With the impressive attention to detail throughout the suite, we probably could have cocooned here for an entire season or more. A wealthy Nantucket socialite originally built the beautifully maintained hotel in 1921. Locals questioned her folly, calling it a “white elephant,” a name that stuck through the years. The hotel is covered in Eastern white cedar shingles that turn gray with age, blending seamlessly with the other private homes and summer cottages on Easton Street and a style used uniformly across the rest of Nantucket. The property was overhauled in the 60s and then renovated again in the 90s. Since then it has been beautifully maintained while retaining the charm of yesteryear. An expansive green lawn with inviting white wicker lounge chairs with blue cushions were just below the screen door of our balconied back porch. The White Elephant is home to the Brant Point Grill, a casual restaurant (open for breakfast, lunch, dinner and Sunday brunch) and bar (open 3-11PM) popular with both hotel guests and locals. Chef Tom Pearson’s menu relies upon fresh, local ingredients, many of which come from the surrounding waters. We enjoyed a relaxed dinner in the Grill’s heated patio room on our first evening; our favorite dishes were the rich Nantucket clam chowder and the succulent two-pound lobster. Several thoughtful touches, all complimentary, were high-speed wireless Internet throughout the property; coffee and freshly baked muffins and pastries each morning (for those who didn’t want a full breakfast); bottled water (replenished twice daily, coinciding with cleanup and turndown service); port and cheese in the Library daily from 4-5PM; and a BMW courtesy car for transportation to and from downtown. Uniformly, everyone we encountered during our three-night stay—from the doorman to the housekeepers to the front desk staff— was friendly, gracious and accommodating. Given the weather, we came to especially rely on Anne Walker, the concierge, for rainy day suggestions: Hers were great. Since we were first-timers, she recommended and arranged a two-hour van tour of Nantucket for an orientation to the Island. The hotel is located in a largely residential area (close to the downtown historic district that is filled with charming shops and galleries). We were also able to walk to the nearby Whaling Museum downtown that same day. The design, décor, and expertly curated exhibits at the museum totally exceeded our expectations of a small museum in a small town. Not only did we learn about the genesis of the whaling industry through a film and displays but also about its ties to the history of Nantucket (I will be writing a separate post about our visit to the museum). The next day, we visited a unique Shipwreck and Lifesaving Museum on the other side of the Island. We enjoyed two spectacular dinners off-property. One of those dinners was at Topper’s at The Wauwinet, a sister property to The White Elephant, to which our hotel provided complimentary van transportation. Had the weather been more accommodating, we would have boarded the complimentary water taxi running between the two properties. Topper’s is the only hotel restaurant in New England to score a perfect 100 on the Condé Nast Traveler Gold List and was named the best overall restaurant on Nantucket, honors we found to be well-deserved. It took three days but the sun did finally appear on the last morning of our stay. And our rainy day hideaway at the White Elephant became even more glorious in the sunshine. We took a walk to the beach and to the historic (and picturesque) Brant Point Lighthouse at the end of our street. There’s an old saying that suggests if you throw a penny into the water near Brant Point, you’ll return again. We threw a couple of pennies into the water and decided to take our chances—rain or shine. Disclosure: Nantucket Island Resorts sponsored our stay but any opinions expressed in this post are our own. Irene, I’m so glad you had a nice time despite the weather! Looks like you had a beautiful last day. Thanks, Laura! Loved the White Elephant and Nantucket. Make sure you tell me the next time you’re in our neck of the woods. I would love to rendezvous with you! We are going to the Brant Point Grill tonight. It’s one of our favorite restaurants on the Island, and we love the view of the harbor. Glad you had a nice time despite the weather. Wow, Alison! Didn’t know you were in Nantucket. Now I have another reason to return! Only part time Irene. The more the better as far as I’m concerned! The White Elephant sounds like a great place to stay. Even on a cool rainy day, watching the boats on the water through a window in front of a warming fire sounds delightful. I like how the resort got its name and the little elephant touches are so great. Yes, it really had a healthy dose of Nantucket charm! My kind of place! That bed looks like the perfect resting stop for me and my book! Love the views from your suite and the food looks divine! Too bad the weather didn’t cooperate fully. But your suite looks gorgeous, as does Nantucket. Those oysters look like they hit the mark too :-). What a classic stunner and the room looks spacious! Now I would love a platter of those oysters. Was so nice to have the extra space on a rainy day! Sometimes sun can bedazzle us into thinking we’re having a better stay than we are. The hallmark of an exceptional property in a vacation destination is to create a superlative experience when an element you may have been counting on doesn’t materialize. So glad you had a fun stay at the White Elephant. It looks absolutely charming! I would have thought that keeping the name, White Elephant, would surely be testing fate! But, it seems not. It looks lovely. And I loved how they carried the theme throughout the hotel decor! I’ve been hearing a lot about The White Elephant in Nantucket lately. I’d love to stay there and explore the cobblestone streets of that Downtown Historic District. I’ve always wanted to visit Nantucket and see the beautiful old homes but now you’ve given me another reason to visit as well. The White Elephant looks like a wonderful place to visit, rain or shine! Such attention to detail and it sounds like they did everything to make your stay memorable. I looked through a few of the home decor books in our room and was stunned at how beautifully furnished many of them are with antiques and period reproductions. 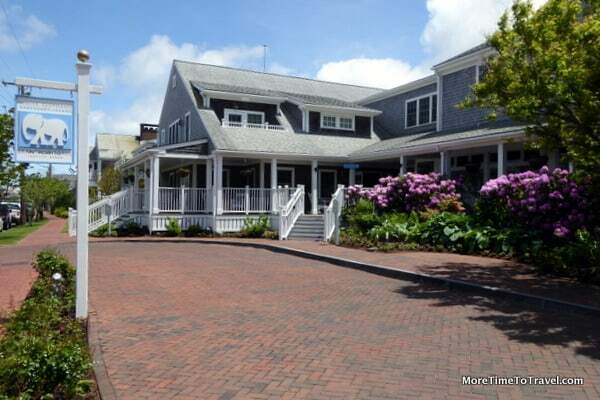 I would love to spend a summer in Nantucket – White Elephant would be a great hotel choice, great location! This sounds fabulous…every bit of it from start to finish. Imagine it with a hefty dose of sunshine…wow! What a quaint little find. Looks lovely and relaxing in any weather.